Happy Birthday !!! May the Lord bless you with all the happiness and peace you wish !!!
" Don't forget to thank ur parents in this special day, thank them for given a joyful and nice life to u"
I wish u all the best to get a gift for next birthday as national award winner. When I clicked your page,it showed 100,000 page views. May you be blessed so many times.May you lead a fulfilling life. Many many many more happy returns of the day. Almost its more than a year since I started reading your blog. More than a singer, I have seen a wonderful human being. Wishes once again Chinmayi.May God bless you always. 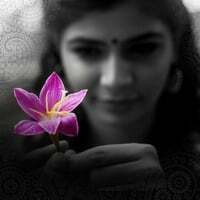 Happy Birthday Chinmayi..Wish you all success this year and as the post says...May God shower all the blessings on you! Have a wonderful year ahead..
For me to open up for the 100th time. Haven't had the chance to meet her. Lucky am I to read, see and hear her works. Lucky are we to do it all. She doesn't know she makes me learn. She's small, tender, good, affable. She's bold, straight, principled, knowledgeable. She doesn't like being praised. I can not stop doing it but. She's A Great Ambassador of Integrity and Woman-kind. And this is all in my mind. Have a nice nice bday. Wish you a very happy birthday! May you be blessed with everything that your heart desires. Loads of wishes for a healthy and a prosperous year ahead. Wishing you a happy and peaceful life dear. May you get all the things that you righteously wish for. I wish you a Very Happy Birthday and a great great year ahead!! May the coming year see you achieve many more peaks of excellence!!! It appears you have really been through some unpleasant moments. Please remember that when you achieve some degree of Fame, for every good turn that you get there will be three irksome moments where you have to act tactfully and avoid getting hurt. Instead of feeling sad and humiliated pick a lesson or two from the experience and forget the episodes. This way you will be able to concentrate on your cherished Goals undeterred by these stumbling blocks. The world is having all kinds of people and you can't change everyone. Indulge in a favourite pasttime. I am sure a person with your talent and multifaceted personality should achieve a lot in Life. God Bless. Am not sure as to what made you right words like these.But all that I can share with you is, "when you want something,all the universe conspires in helping you to achieve it." May your life be as you wish it to be. Happy Birthday!!! Have a Great Day!! Today (10/09/09) is a special day as an angle was born on this day several years back, that is you. Past is past, don't worry about the past, look forward to the future. Live each day to the fullest and I hope that the upcoming days will be great for you and your loved ones. :) Once again Happy Birthday!!! Happy Birthday Chinmayi! Good to see that many good things are happening because of you! Keep it up! and we're back at Sunday! Ivalo kashtapattu effort pottu rhymes ellam ezhuthi office la secret a blog la comment panni wish pannathukku return la just one kostin. Have lots of birthday funs. wish you all happiness in upcoming year..
Belated birthday wishes to you! Have a fun-filled year!! அன்பு நெஞ்சங்களில் அடியேனும் ஒருவன். வாழ்க வளமுடன்! நலம் வாழ என்நாளும் என் வாழ்த்துக்கள்! பிறந்தநாள் வாழ்த்துக்கள்! சந்தோஷம்! Wish you a wonderful year ahead. May God give you more and more strength to soar higher and higher in all walks of your life. Wishing you another wonderful year of happiness and joy….. Happy Birthday! Happy Birthday Chinmayi and wish you many mnay more happy returns of the day! As a (wo)man grows old, (s)he becomes wise. This comes from the experiences in life, some good and some not so good. I am sure you will take it all in your stride and chug along as a happy person. Happy Birthday..! May ur wishes come true..Keep the gr8 work going..
My prayers to the Almighty to be with you always, guide you and bless you. Wishing you success to continue and prosper ahead. I bet your mom must be really proud of u. Keep up the good work. So when are you going to tie the knot? wishing you a wonderful birthday. your blog is very inspiring. For me it has become a routine to check ur blog updates along with my mails. Happy Happy Birthday Ms.Chinmayi. Wish you joyous and happiness for an another year of your life. God Bless you!!!! பிறந்த நாள் வாழ்த்துக்கள்... வாழ்க வளமுடன்!!! Belated birthday wishes and wish you a great year ahead, Chinmayi! wow! what a phenomenal day 09/09/09! Happy Birthday! Always remember: failures are the pillars of life. Best wishes towards your bright future. அன்பு சகோதரிக்கு இனிய பிறந்தநாள் வாழ்த்துக்கள் !!!! Belated Wishes..... Have a Nice year Ahead.. !! Truth ,Wisdom , Learning ...curve to continue..
"I intend to use the popularity that I have earned for a greater good." OMG!!! Get over yourself. Look beyond the own little universe you have created for yourself. You are really not that big of a deal. P.S. I dont expect to see my comment published either. I'd actually rather it is not. shud a person like YOU be so concerned about such (navin's) comment? U r right that these are passing clouds Those who say like this dont trust themselves even and wherez the qn. of trusting anything else? they may feel by saying like this makes them so much humble but indeed show their lack of self-confidence. one who love their life only can show love to others!! i say...LOVE YOURSELF...LOVE YOUR LIFE...LIFE LOVES YOU...AND BCOMES MORE AND MORE LOVEABLE...!! To Naveen: Our lives revolve around our goals, friends, family and also foes. I think all of us create our own universes that is made of all that which affects us directly and indirectly. I am obsessed with becoming a better person and I will keep expanding my universe. I have not given you so much importance in seeking your opinion or permission on how to lead my life. Peace out. Vijai: Perhaps not. You are pretty right. Belated Happy Birthday Chinmayi! Hope you had a wonderful day! I pray that you have a fabulous year ahead & many more to come! Wishing you all the best in life, coz you DEFINITELY deserve it! Keep being the awesome person that you are! Rock on! Phew., looks like my sunday ritual of visiting blogs made the late person to this post ! Belated wishes, pray that some of your old, pending wishes come true this year. Ensoi, have fun. Belated birthday wishes! Here's wishing you only the best of the best and may you be more successful than ever (without the bruises and pains of course) and may the Lord grant all you wish for.